Why not make damage multipliers additive instead of multiplicative? Then they'd be damage adders, instead of multipliers, and depending on what they actually added, it may not change as much as you think. Probably because multiplicative is more intuitive. If a mod says it gives you +10% increased damage with multiplicative if you were doing 100 damage you know with the mod you will do 110. If it is additive you have to figure out what is your base and what is the sum of your other modifiers. They could add an icon like boon/condi duration. 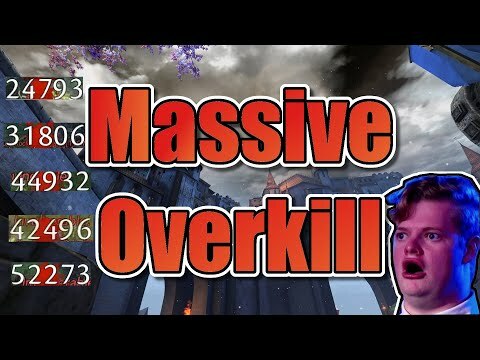 Part of the problem in high end pvp and wvw are multiplicative damage modifiers giving out too much damage on skills that are balanced without them. The game could tally up your modifiers, then add that % the same way it currently does. Only without the added multiplicative portion. No more one shots. There are other considerations here, like damage modifiers with ferocity etc. Also, i'm not 100% sure about all, but some damage multipliers at least do indeed stack instead of simply adding up. All those from traits, for example. all damage modifers except for ferocity stack multiplicatively. is 1.1 x 1.1 x 1.5 x 1.4 x 1.05 for a total of 2.67.
multiplicatively it currently is a 167% damage increase. each multiplier is worth more than the one before it, so the more you can stack up, the more absurd the damage gets. with all of the invulnerable/evade/block frames available right now, you can pretty safely stack them as high as possible. this is what causes fights to last <2s as you either block, dodge, or die. So you are claiming ANet has no in house testers? Maybe they should fix that instead. They should have some anyway. It's a strange claim even if you didn't mean that. Why wouldn't skills be designed for the modifiers' existence when it is either the same people designing both or the people making the skills should at least be aware of their existence? Do you think the devs do not know their own game? That would be a problem that needs fixing too. multiplicatively it currently is a 267% damage increase. As opposed to just standing there trying to shoot/hit back? Isn't that the point: You either block, dodge or die? It seems to me that they're working as intended, and if you're caught out, you're caught out. The other thing to bear in mind here is that, unlike in GW, your PvP toons, and your opponent's, are used in PvE as well. These damage spikes are needed in group content. you can't just tell the group leader "Well, I think these multipliers are OP, so I don't use them". That is still the wrong order. You need people who know the game well testing it regardless. Additive mods are also biased towards classes with more indirect stacking. An attack speed mod is always going to be a multiplier. As opposed to it being 2s per encounter? I've tried to get new people into competitive game modes four times now, and that's always the reason why they have no interest. By making multipliers additive, it makes it easier to balance, which leads to better gameplay. Instead, we have a balance patch, a week later one or two classes are hilariously overpowered for 6mo, then it repeats. Welcome to MMOs? They are never going to be able to balance PvP. There will always be that one guy that finds a combination of effects, or whatever, that slipped through the cracks. Some MMOs have forums dedicated to just that, including this one, since it does have class forums where builds are discussed. FotM is a thing for a reason, and that's the reason. It's been my experience in PvP discussions that players won't ever be happy until every class but their own is using nothing but basic attacks. It's a pretty common thing, and the source of the "Nerf rock, paper is fine as it is, scissors" meme. So let's say they make them additive, and someone stacks all bonuses they can, then what? Limit the number of bonuses you can stack? That's already sort of a thing, only so many skills/weapons you can use. The thing you're trying to get away from, dying when you don't dodge or block, should never be a thing, if someone is unloading on you while you stand there shooting/hitting back, instead of actively attempting to defend yourself, you should die. That's like trying to get boss AoE damage nerfed because you don't want to be mobile, and get out of a circle of death. Changing bonuses to additive instead of multipliers won't fix anything as far as "I'm going to stand here and shoot back while you unload on me" goes. You'll live what, maybe one more second? So instead of one shotted you're two shotted, and then it's back to the forums, looking for a way to make "just stand there and shoot back" viable? I'm not looking for stand and shoot? Nothing I've posted here even suggests that. The difference I posted above is accurate. 110% damage vs 267%, just from this change. There would still be strong defensive utility in that setup, and strong offensive burst. There wouldn't be one shots from stealth. It would strongly limit the rng factor in fights, a proc doesn't mean you immediately should win. There would be more counterplay instead of passive immune trait is up or you instantly die. The current meta is awful and stops new players from joining. This would be fair across the board as it affects each class equally. Just looking at ways to make ttk increase. If you have any real reasons why this would be a bad change instead of strawmen, please contribute? I can't honestly say this would be feasible at this point in the game, not without severe disruptions and unhappy players. Frankly, even if it did simply balance, I wouldn't readily conclude it would pave the path for devs to achieve balance. It seems like wishful thinking to me. if the goal is easier ability to balance, I would say that the impact changing from multipliers to something else would be negligible towards that goal. It equals ~ a 19% improvement in damage for me having multiplied instead of added. This is assuming I meet my damage multipliers' conditions like target below 50% hp, vulnerability present, fury present, self hp over 90% and so on. That gap drops drastically when large multipliers are removed from play. Wait what? I've never seen a game do that before. As things stand, the final damage done is divided by the enemy's armor, thus power in GW2 sorta acts as both "damage" and "penetration" attributes from some other games. The result is that, loosely speaking, your character can go full glass (no toughness, dies to any damage), bruiser (a bit of toughness, will take significantly less damage from tanks, but is still susceptible to glass cannons), or tank (a lot of toughness, survives even glass cannon's power burst). I mean, I haven't done the proper math to back up my reasoning, but that's how I generally think. Yeah guild wars 2 wasn't really built for so many damage multipliers. Many games that I have played do indeed take multipliers and pool them together additively then apply it multiplicatively to the base with the occasional outlier mulitplier that is applied separately. Making the multipliers additive in guild wars 2 wouldn't really do much beyond shaving off ~20% damage on super glass cannons. That may save some people from oneshot but it wouldn't suddenly make them capable of surviving any follow up attacks. Instead of reading about oneshots we would be seeing people complain about going form 100%-0% hp in 2 seconds. There is literally 0 reason to change from a multiplicative system to an additive system. If the current damage is to high, just reduce the multipliers. Problem solved. If you want damage toned down, make a strong argument about it. Your argument to change the system is weak at best. That's not even getting into the risk of the perma bunker meta returning. There is a reason why arenanet is currently keeping time to kill low, because certain sustain classes are un-killable otherwise. Which causes a very own balance problem. TL;DR: multipliers being additive versus multiplicative makes no difference since all variable can be changed and adjusted to any liking. Mm yea, I think it wouldn't be that big of a difference. But as Risen Howl has stated, I think it'd be a better platform for proper balance changes as the current foundation is questionable. Oh, sorry, I based that off what you said about not blocking or dodging and dying, maybe you meant something else? That's a 34% increase. 2.15- 1.81. 34% isn't enough of a decrease to lower glass viability, but it's definitely enough to increase ttk. Which is healthy for competition. You're right, it's a 2.67 modifer. Or 167% increase. Editing that post to not mislead. My bad! Reducing the multipliers is difficult to balance and doesn't address the core problem. It leaves too much room for power creep down the line. By going with additive damage, the whole system becomes much easier to balance. For both dps and bunkers. Since the balance team is having a difficult time, this seems like an ideal solution. And that math is correct, think you missed something there. Might have missed a number? So what you're saying is that if you mess up your rotation, you're toast. Whether the multipliers change or not isn't going to solve that, it'll just give you a second chance to blow your rotation, especially if it's cooldown based against something that's not. I just don't see this "fixing" PvP. I'm especially perplexed because, quite frankly, there aren't over 9,000 threads asking for this. If people well and truly believed that this was the case, I assure you there would be. Maybe, instead, something can be done to bolster defensive abilities? Maybe take a look at builds and see how much defense is being taken out in order to increase offense? I know that dps class forums are always about how to get those big numbers, and that survivability is always based on killing them before they kill you. Is it likely that that is happening here too? I've been in a lot of PvP fights, in a lot of games, and I've been one shotted more times than I care to remember by players coming out of stealth, which is supposed to happen, one shotted or dropped so drastically that you die on the next shot. I've handed out my share too, but I never thought, not one time, "Man, if damage bonus multipliers were lower, or didn't exist, he couldn't kill me". I always thought: Man, I need to pay more attention. If you have any friends who don't pvp/wvw, ask them why. Increasing defensive skills just leads to power creep, next patch is a boost to offer sive skills and we're back where we started. If you didn't play vanilla gw2, check out some videos from then. Ttk was a little longer and there was much better build diversity. Every meta class right now is glass or almost glass with as many dodges/defensive cds as possible. Why are you assuming they wouldn't increase the base damage then? Yes, the difference betwen the person that stacked all the modifiers and the one that didn't would be smaller, but all that would mean is that even people without said modifiers would demolish you in seconds. The quote chain is getting obscene, so I'm just going to reply here, to clean it up a bit. So glass cannons are getting blown up, so it's power creep? The whole point of a glass cannon is that they will get blown up if they're attacked. In so far as the understood definition of glass cannon goes, that's working as intended, and not just from a developer mindset, but a player mindset as well. There's a big difference between that and "If you don't dodge/block you'll die" in a general sense, because glass cannons getting blown up is to be expected. You say they're stacking as much defense as possible, but that they're also glass cannons, but that is contradictory. While I'm sure that power creep may be a contributing factor, build decisions are as well, and altering the rest of the game so that a glass cannon won't be so fragile is putting the cart before the horse. I'm sure that there are plenty of glass cannon players that are fine with "if I get hit, I'm toast". I'm basing that off of the fact that this thread isn't 90 pages long with "yeah, I need to have all the offensive capabilities and bonuses I can stack, but not be a glass cannon doing it". The majority of people that build a glass cannon know exactly what they're in for. The rest have copy/pasted a build, and can't understand why their survivability is so low. Play around with the builds before asking for major changes to the game to accommodate glass cannon builds. You may find that players that build that playstyle may object to your idea of a "fix", because they built specifically for the big numbers, and you're trying to take that away. Power creep is inevitable, it's a direct result of having a level up system, and it exists everywhere there is one. The first course of action isn't to nerf the game, but to evaluate character design choices to find a way to best deal with it. I guess you missed everyone telling you that it would change very little as people getting one shot are still going to get blown up. Well, an extra second is still better than nothing. I've rarely gotten one shot in nearly any situation in wvw, except on my thief. The thing is, nerfing numbers isn't going to change the fact that there's always multiple things interacting with each other. That's why balance has always been so bad. They have to buff and nerf taking into account how the trait or skill or boon interacts with other boons. Post-HoT, nearly every class has multiple things going on at the same time, and changing one thing could have bigger effects than it should be, since it multiplies together and that makes it hard to make more subtle changes. You can run a full pvt guard and still get dropped in <2s, that's not a glass build. I'm saying it doesn't matter if you're tanky, the power creep has gotten so bad there's no difference in survivability. There's really no point in running anything but minimal tank stats, or even a point to having those stats. Glass cannons just chain passive invulns with blocks and evade frames. There isn't a point to playing anything else as it does not increase ttk, just lowers your own output. The game was not always like this, it used to be enjoyable and attractive to new players. Look at mirage right now, they're literally unhittable for 10s at a time while they can freely unload. All of the meta classes have the same mechanic, high evade/invulns uptime and full damage stats. What I'm shooting for is a way to decrease power creep and make balancing easier on the dev team. Seems like that's a concept that you guys are having a difficult time with. Pretty sure that's something everyone here would agree is healthy for the game, but no one has any ideas on how to get there. Taking 20% off all the glass cannons would be a step in the right direction, would it not? Would taking 20% off of all the glass builds be bad for balance do you think? Especially doing so in a way that limits future power creep and allows for easier balance of bunkers and dps alike? I think it's wasted effort. Just reduce the number and intensity of damage multipliers along with increasing their access difficulty. It's not hard to get fury on a rev and putting a trait that gives more damage for having fury is nice but also kind of cheap. Then there is sic'em on soulbeast... They did recently remove 5% damage modifier from scholar runes in exchange for ferocity but it didn't really help much as the ferocity amount given weighted against full berserker is like a 4% damage increase anyhow for a net of -1%. Also a Dodge tutorial in starter areas like Queensdale would help. People should not be eating Drop the Hammer openers which I pull off ALL the time. Not about stealth, just as an example. Stealth is put in game and is made base mechanic of class. stealth goes back to be broken. Something similar happens to the damage: HoT brought a lot of missing sustain, now PoF brings over the top damage. Additive makes sense in a pvp scenario as you can calculate easily the max damage multipliers any player may get at any moment, and even put a cap on it like it is done for the boon duration. Also the most of the game handles the no-damage modifiers additively which makes the disparity between damage and resistance to damage (hp and armor) more obvious. -% damage is multiplicative. If it were additive every revenant would be playing jalis/retribution and every other class would be stacking protection and damage reduction food. Remember, that in pvp any glass build that can't kill their enemy in few seconds is useful only for supplying points to their enemies. You are basically asking for glass builds to become useless. If that happened, the natural consequence would be to increase defences of glass builds somehow to the point they will be able to slug it out with opponents inmuch longer fights. In which case any bunker build will likely end up being unkillable. And in PvE... why would you do that? It won't make any non-glass cannon any more useful than they already are. That is, however, PvP. That's how it works, mate, you're not up against mobs anymore, you're up against other players that are building similar to how you build, and if they catch you with your pants down, figuratively speaking, they're going to own you, and, as we can see by the existence of this thread, there is a point to minimal tank stats, survivability. That will, of course, be paired with playing properly, and not messing up a rotation, which can happen to anyone, but the fact that we are here discussing low survivability, with one of the best cover stories ever for low defense builds, shows that there is indeed a point to looking at changing up a build. Here's the thing, I'm not having a difficult time with this at all. No, adversely affecting the entirety of the game, for PvP, would not be a good thing. Learning to build PvP characters would be a good thing. Learning what a glass cannon really is would be a good thing, but coming here screaming for nerfs because you're getting owned in PvP? Not a good thing. That's absolutely not correct? If they don't get a kill in the first minute, they disengage and +1 another point. Try and catch a good holo, slb, sb, mirage, or thief. Good luck! I can't get any friends to pvp because it's got such a high learning curve, due to the power creep that's built up every single patch. The same power creep that this would reduce. Fights have little to do with skill. It's a matter of who executes their defensive rotation well and gets a lucky proc or stun chain. That goes for both myself, and the other people in plat. You can say it's skill all you want, but when every hit chunks whoever you're fighting it really isn't. Every match is straight up rng, whoever gets the silver placement loses. Whoever gets caught mid dodge with a floor effect explodes. It is nothing like pvp used to be for this game, which is why it's been bleeding pvpers. This is a step in the direction towards fixing that. But please, continue to condescend and be toxic rather than propose solutions. Glass cannon builds are being one shotted left and right, and other people only last a couple of seconds, so the game is broken. News flash: Glass cannons will, by definition, melt like butter under a hot knife if they're attacked. It's why they're called glass cannons. Unless you're hiding out in some corner of a PvP zone trading wins with a friend, you're likely going to be attacked by more than one person at a time too. Are you going to start a new thread insisting that players can only do 1v1s next? It would make every bit as much sense as this thread does. Anyway, you are aware, I trust, that there are events that happen game wide that take large groups of people to complete? You are also aware, I trust that some of the more complicated ones are also timed? So using your rough figures, it's ok if it takes 20% longer for the PvE stuff to wrap up, to keep you from being one shotted in PvP. I've seen some dragon fights come right down to the wire. Under your system, they would have failed, but that's ok, because "mah PvP", right? Yes. Now. You're however asking for their damage to get nerfed to the point where they won't be able to do that anymore. There's no meaning in being able to disengage and reset, if your damage isn't high enough for you to burst the enemy in the first place. You will then just continue to half-burts, reset, half-burst... and so on, until at some point you will fail to diesngage. You may be an annoyance, but you won't be actually a danger. Not against a decent player anyway. Wanna bet that all of those huge numbers were on glass cannons as well? I think there's a miscommunication somewhere. Glass cannon builds are not being one shot. EVERY build is being one shot. Because there is very little difference between ttk for a tank and a glass cannon. So EVERYONE at high elo is playing glass. EVERY fight comes down to completing a defense rotation or disengaging. Because everything hits like a truck. My complaint is that power creep has gotten completely out of hand. Check out that video of the ranger, tell me that's healthy gameplay. Damage needs toned down in competitive modes. The easiest way to do so is by changing how damage is calculated so that it cannot be inflated to the degree it currently can. The game is 100% based on active defenses and passive invulnerability traits now. It was not always like this. Competitive game modes were once enjoyable and attractive for new players, too much power creep has made it difficult for new players to join. Without a change that attracts new players, these game modes will become more toxic and die. I would not like to see that happen. You are aware that skill splitting between pvp/wvw/pve happens? By making the system additive, they can simply double the modifiers in pve. Now pve ttk is unchanged, while ttk in pvp/wvw is increased. Do you think that power creep is healthy for the game? Do you not think it should be reduced? That is the problem I am trying to address. Good? It's awful gameplay. Blast into evades at each other for 30s, then run away. Repeat until the lowest player is found, train them for a 4v5 into a snowball. Literally every match. It's too much damage, which power creep has added to by implementing too many perfect defenses, which then require bustier builds. Back and forth. It needs toned down, but it seems like the development team has no idea how to do it. By making multipliers additive it brings in all of the highest performers, allowing damage to be balanced more easily by the devs. This in turn means defenses can also be reigned in. The goal is to reduce power creep. I haven't seen any good ways to do so posted, this way is a fair across the board change. I'd be willing to bet that some of those are glass cannons. Id be willing to bet that some are not glass cannons too, because I've gotten hit for that kind of damage with 2.5k toughness and 20k hp. I think you are still making some incorrect correlations. How damage is calculated has nothing to do with high damage or burst. All variables can be manipulated. The fact that balance patches every X months do not reduce all damage across the board is indicative that developers intend damage to be this high. They CAN reduce damage significantly as seen post PoF launch where elite specializations were flirting with 60k dps and above, for a week. Now take into account the move against the bunker meta, thus not wanting to have super tanky builds live for ever in spvp, and you might have a culprit for your issues. TL;DR: if you want a more tanky spvp meta, make a case for it and against the anti-bunker approach currently in place. This has nothing to do with multipliers. Back in March, or April there was a thread talking about this game moving towards a trinity type system, and everyone, myself included, was basically against it. The reason that "tank" builds are being mistreated in PvP is that, for all intents and purposes, there are no "real" tanks. There are classes, and builds, that can tank more damage than other builds, but they are, essentially, what would be considered off tanks in other MMOs. Not someone you'd want for a main tank, but they'll do in a pinch. This has the side effect of everyone taking loads of damage in PvP. In PvE they may be doing alright, but, as I pointed out earlier, PvP is a different animal, and where you have the occasional mob that can eat your face, everyone you fight in PvP is capable of it, and so, if you mess up, even on the tankiest build you can make, you're going to be toast. This has little to do with crit multipliers, and more to do with the fact that, even in a heavy armored class, we're short a lot of the damage mitigation a "true" tank would have. The majority of the classes can, in a pinch, fill all three roles of a trinity. This comes at a cost, and that cost is that, unlike in other games, we don't have a "meta" for who does what. We could assign it, there are classes that actually have taunts, there are classes that are better at healing, but at the end of the day, every class in the game is a dps class with auxiliary skills. Trying to apply standards outside of that framework to this game could make a lot of things seem broken, or more broken than they are. A note from Captain Obvious, but I read the forums. I don't respond to every thread I read, but I read the forums. Every aspect of this game is competitive, Fractals, OW, and WvW/PvP are all competitive, to read around some of the topics, and more importantly, some of the responses in them. Some people are "tired of it", or are worried that it's adversely affecting the community, and that's with things as they are. Imagine having to take 20% longer to do a dungeon with an unpleasant person, or people, in it? That's the scenario you're trying to create. The biggest mistake ANet made was not keeping PvP and PvE completely separate, and by that I mean you had PvP toons and skills that could be tuned according to backend data, that would have 0 effect on PvE. If that were the case here, I'd have ignored this thread completely, it wouldn't effect anything I do to pass some time. In the current system, however, your changes will break a lot more than they fix. So I guess looking for a balanced meta is out of the question? Because that's what I'd like to see. Some of the power creep toned down. The way to do so is by reducing burst and by reducing passive invulns. We can't reduce the invulns until damage is lowered. The most fair way to lower damage is changing the system from multiplicative to additive, as that affects each class the same way. Then shave a second off invulns, shave off 20% from all endurance regen traits. Voila, ttk is increased but the game retains its fast pace. For what game mode would thus idea be broken? If anything, this would be a buff for pve. It would increase ttk in pvp/wvw. It would tone down perfect defense rotations, which nerfs bunkers. No? If you take 20% away from endurance regens, you're shortening a fight by 20% in PvP. This would have the opposite effect of what you're trying to accomplish. Taking away iframes will mean that you're always going to be taking that damage, which will also lead to shorter fights, thus accomplishing the opposite of what you're claiming to aim for. I'm starting to feel deceived here. Endurance regeneration traits. Adrenal implant etc. This also hurts bunkers, so we don't move back to a bunker meta. It's PvP, they're always needed. That's what the dodge tutorials teach you in every starter zone. How to dodge, and why you should do it. There seems to be some kind of secondary agenda here, and the more I read, the more I feel like someone dodged one of your one shot kill skills, and then, while you were raging about that, one shot killed you, and you had to come up with a reason, and so here we sit, discussing crit multipliers, and nerfing defensive skills and tactics "to make fights longer", despite the fact that it would have the opposite effect. Simple logic there. An example scenario: Your system cuts 1 second from iframe, and I use a skill that has a 1 second iframe to dodge your attack. For this example, you cannot crit, there are no crit modifiers, so it's all just base damage. What this does is make it so that instead of avoiding that one attack, I take full damage from it, negating the endurance I spent dodging your attack, and, with a lower regen, making it pointless to try to do so again. How is this going to make a fight last longer? The simple answer is that it's not going to. It's going to make all fights shorter, even ones that would naturally be longer in the current system. That's what happens when you nerf defenses, they are nullified, meaning that you may as well not have them, but this is supposed to improve PvP? For whom?